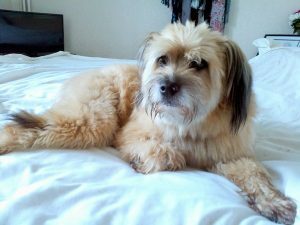 16/2/19 – Wispa has gone to her new home! 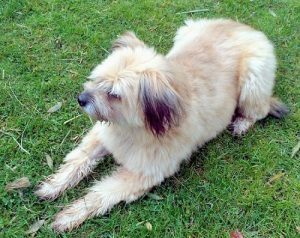 Fluffy Wispa is a Pyrenean Sheepdog girl of 11 years, who came into Oldies Club care when her owner became too unwell to care for her. 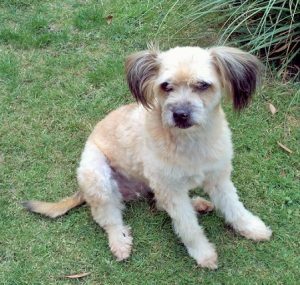 She’s in an Oldies Club foster home in Hitchin, Hertfordshire, but needs to move urgently as her foster carer is going away. A happy girl in foster: Wispa settled in to her new surroundings instantly. Finding everything to her liking, especially the beds! 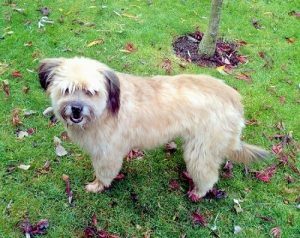 Can be left for a few hours: Wispa is at ease in her own company and can be left for 4-5 hours. She could possibly live with fulltime workers, as long as she has a walk or garden break at lunchtimes. Wants to be your only pet: Wispa is wary of other dogs she meets and chases cats (such fun!) so she needs to be the only pet of the household. 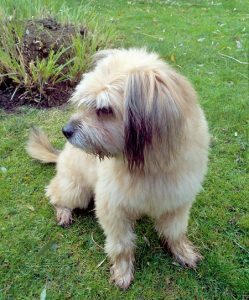 Would like an adult only home: Wispa hasn’t been tested with children but she is a sensitive girl and she would find small children too sudden. Visiting, older children who respect her delicate nature should be OK but she’d probably prefer living with just predictable, sedate grown ups. Loves walks: Wispa gets very excited about going on walks. Despite her enthusiasm, she’s still good on the lead and her recall is excellent! Good in the car: Superb in fact! Wispa’s favourite pastimes: Running free in a field, snuggling up to you on the sofa and, of course, eating! Nom nom nom! Wispa’s dislikes: She is a bit nervous around strangers, particularly men. People who come to the door will be told that they better jolly well behave themselves! She sometimes barks at people when out on walks and has seen a behaviourist since being in foster, to help her nervousness. The training is helping, but Wispa will probably always be a bit jumpy. She needs a calm and sensible owner. She’s used to wearing a muzzle when she’s out because she gets so anxious. She will snap if her worries are not noticed and respected in time. Wispa’s ideal home: A lovely, peaceful home with a garden and one careful lady owner. Health notes: Wispa is spayed, vaccinated, microchipped and flea/worm treated. She’s healthy and the only ongoing maintenance she’ll need is the odd grooming session. Because she’s worth it! 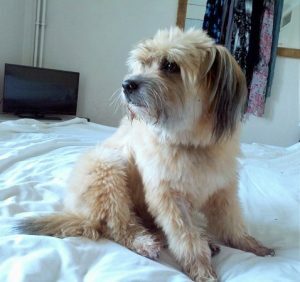 Wispa can be rehomed anywhere on the UK mainland, subject to a satisfactory home visit, but note that you will be required to travel to the foster home to meet her.